1.Preheat oven to 450°. On rimmed baking pan, toss grapes, 2 tablespoons oil and salt; top with rosemary. Roast 8 minutes or just until grapes begin to burst; remove and discard rosemary. 2.Heat grill pan over medium-high heat; brush with remaining 2 tablespoons oil. Grill bread 1½ minutes per side or until grill marks appear. 3.In small bowl, stir chèvre and honey. 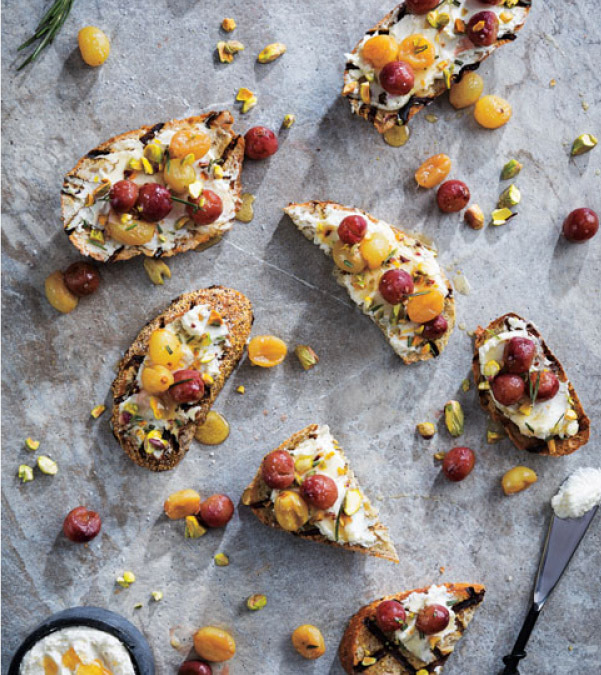 Spread grilled bread with chèvre mixture; top with roasted grapes and sprinkle with pistachios and rosemary, if desired. Cut larger slices diagonally in half.